O’Sullivan Architects has been a fixture in downtown Reading for almost a decade. Our office is located within the historic M.F. Charles building and just a stone’s throw away from the town’s former post office. Over a year ago, the post office relocated to a smaller space, thereby leaving the existing historical building vacant. It was a great opportunity to work on another historic building in town. During the 2016 sale of the former Reading Post Office, the closed building was deemed eligible for listing in the National Register of Historic Places by the Commonwealth of Massachusetts. In doing so a “protective covenant” was placed on the historic building,aimed to preserve the key components of the building, including the entire 1917 original building. The covenant was very vague and left much open to interpretation, creating a difficult task for the design team. Though there are Federal Design Guidelines that exist to help one work with nationally registered buildings, Congress has admitted the regulations are difficult to apply to post office buildings. With little precedent at the national level, the project team took a collaborative approach for the design solution. 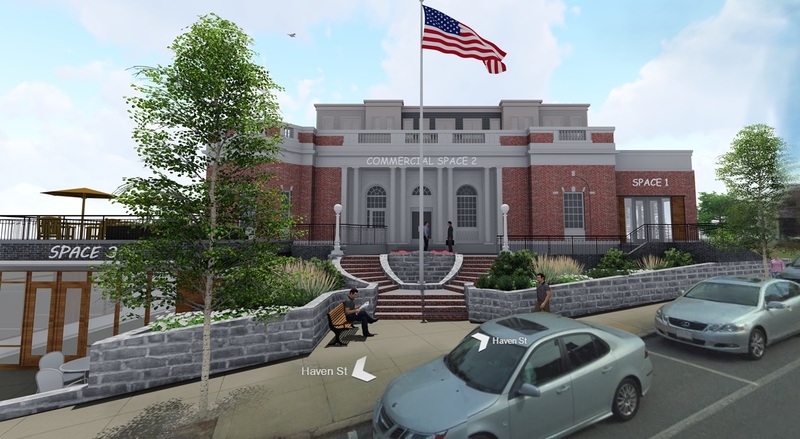 Working with our client and both the Massachusetts Historical Commission and Reading Historical Commission, our proposed new addition and adaptive, reuse renovation design not only preserves the original 1917 building’s beautiful façade. The project includes 50 residential units in a new, contemporary-style, rear addition designed to complement the original structure. As reported over 100 years ago in the local newspaper (Daily Times Chronicle) on March 2, 1917, the Post Office was to be “a valuable addition to the public buildings in town”, with “impressive design and ornamental enhancements like Corinthian columns and a water fountain in front of the building. Our design includes restoration of these enhancements”. The design incorporates several elements to preserve the original building. The first of which is that the addition is fully behind the original historically significant structure. The original façade will remain quite prominent with a seamless transition to the new rear addition. Another element allows the existing building to take advantage of its unique location in Reading’s downtown area. 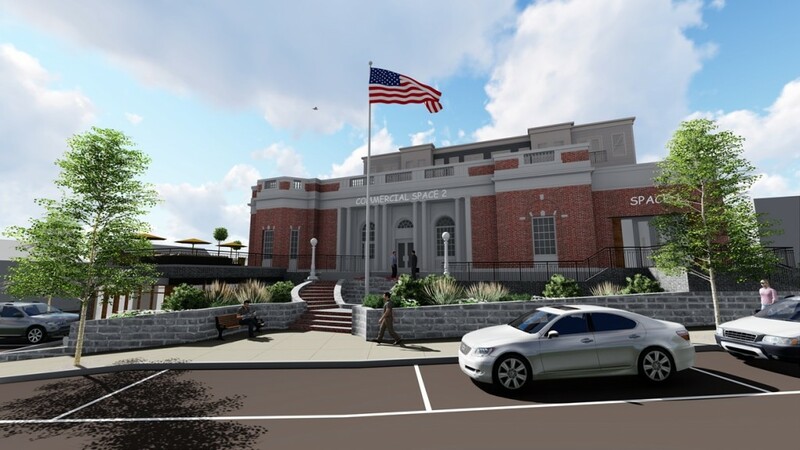 Situated on a corner lot, the former Post Office space will be reused to provide three new commercial tenants that readily draws passerby in with its classic architecture. As an historic building, the original façade will remain preserved in perpetuity. A third goal was driven by the Chapter 40R Smart Growth zoning of the site which provides housing within the mostly commercial downtown. This zoning classification gives residents the feel of city-living with business and the commuter rail in easy walking distance while in a suburban town. We also created a dedicated courtyard space for residents providing the opportunity to enjoy the outdoors in a semi-private atmosphere. 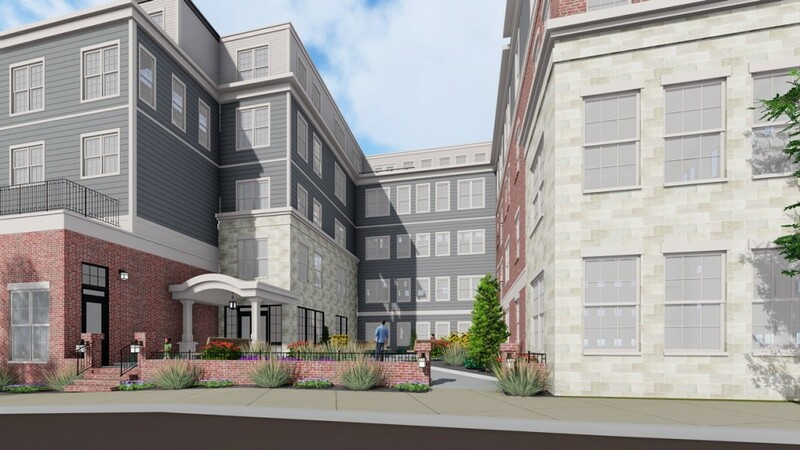 As the courtyard is located on a side street and will serve as the main entrance to the residential units, further delineating the separation of the new and existing; as well as providing separate, but distinct entries for the commercial and residential uses. The process from concept through full approval took approximately 10 months. 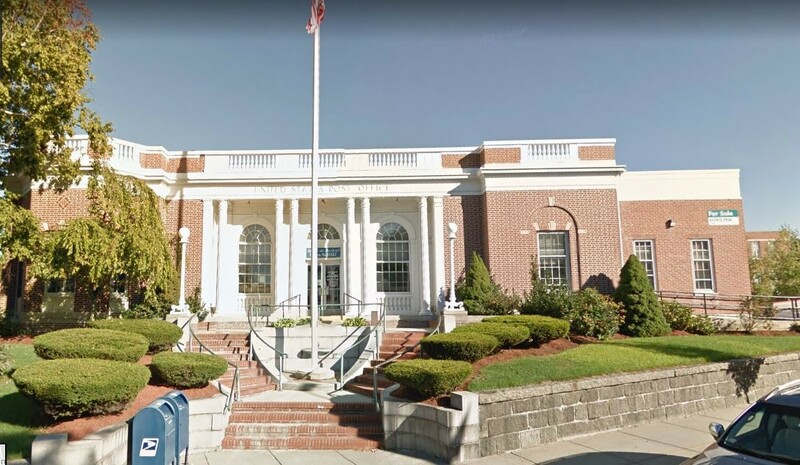 We worked collaboratively and closely with the town of Reading and the state of Massachusetts’ Historical Commissions to ensure we not only adhered to federal guidelines, but that we addressed any concerns these Commissions may have had. The overall footprint of our addition is further set back from the original building and the top floor is set back so that it is not visible from passerby and does not create an overbearing impact on the historical building or the surrounding areas. We also worked with Reading’s Community Planning and Development Commission to comply with Massachusetts Chapter 40R program. This program allowed us to create a dense, mixed-use project within the Smart Growth Zoning Overlay District. Chapter 40R increases the supply of housing in downtown areas and targets the shortfall of low and moderate-income households by including a caveat for affordable housing units. This project is historically significant not only in its status on the national registry, but also as the first of its kind under federal guidelines. And, we are happy to note, has received approval from both the Town and State. O’Sullivan Architects along with our client and full project team look forward to the ground breaking and ultimately the final product. 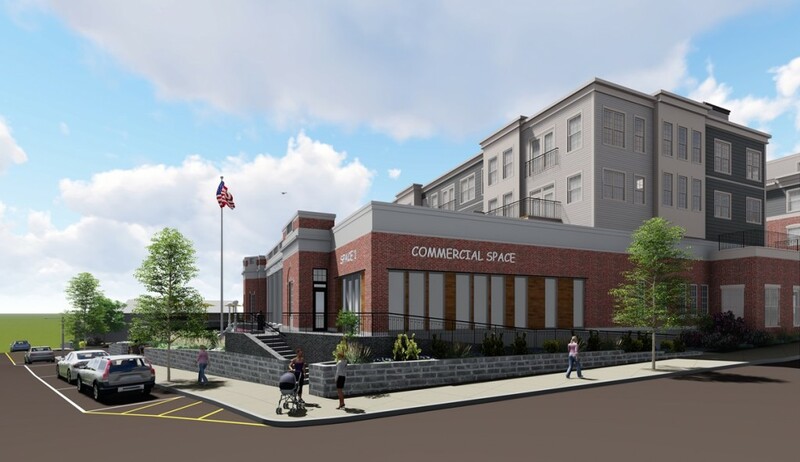 Please enjoy the video (below) to view our adaptive reuse design of an old town staple – transforming a closed post office into 50 residential condominium units, three commercial tenant units, and onsite underground parking.